Well, you posted about bringing it home. And it would clash with Lureen's cowgirl hat. Meanwhile, I wish I were in Cheyenne digging into Steak Diane. I wish I were in La Jolla, eating anything by Goya. Well, I wouldn't wear them together. 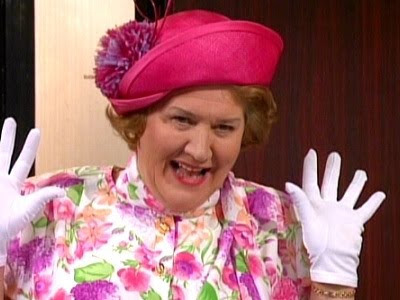 I wish I were in Phuket, enjoying a meal by Hyacinth Bucket (candlelight supper, of course). I wish I were in Juneau eating salmon, don'tcha know.